If you are the type of person who wants to be a blessing to others then I am certain that God places those opportunities in front of you from time to time. Do you take them? Do you wish you could take them and don't? There are many times in my life that I just could not take advantage of the opportunities God sent my way, at least I thought I couldn't. That was the devils plan to convenience me I couldn't but I look back now and believe that if I had just stepped out in faith and took the opportunity to be a blessings I too would have been blessed in return and made the devil a liar just as he is. I want to tell you a story about a opportunity that one of my Operation Education sponsors took last year. Let me introduce you to Keling. In March of 2014 during my trip to Ceibita I found Keling in a distraught state of mind. A few days before I arrived her dad (the man in the above picture) left his family for another woman. He left them with no income and no food. Keling's heart was broken into many pieces and for a 16 year old girl the thoughts of her dad living were too much for her to handle so he decided she was going to commit suicide. She had tried the day before I arrived and failed (PTL). I was able to sit with her and encourage her with the word and give her a hope she could not find at the time. A hope in the fact that God was her father and he loved her very much and would take care of her even if her earthly father would not. She had a great deal of hate in her heart for her dad and was extremely bitter toward him for some time after. 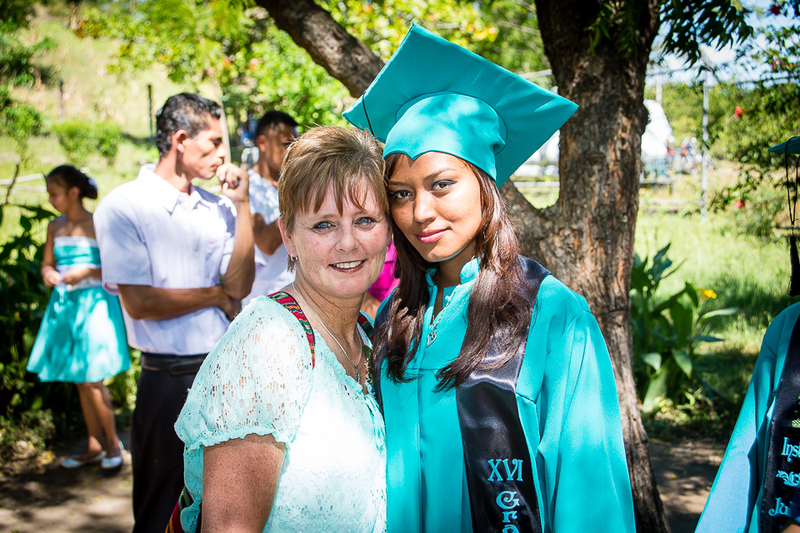 In August 2014 one of my sponsors who went on the trip with me met her and felt led to help her attend college. She was beyond overwhelmed that a total stranger would go out of his way to do this for her yet her father would not even provide food or basic needs for her. This opened a door for the relationship between God and Keiling to grow even more than it was. She started focusing on her life, her relationship with God and her studies. I am proud to say that this week is her last week of her 1st year of college and she is an A student. This is a great testimony of how God can take all bad and make it into good if you let him. The picture above with Keling and her dad is the second testimony of this story. God healed her heart toward her dad and she allowed him in December 2014 to walk with her on her graduation day. Since then God is restoring that relationship little by little. I am so proud of Keling and I reminded her yesterday that God is her father and his love for her will never fail. The enemy wanted her life but God had other plans for her. I'm excited to see what he has in store for her future. I have a great opportunity for one or more of you to be able to bless another student like Keling. Let me introduce Francisca to you. Francisca is graduating this December from high school and she wants to become a teacher. She is determined in her heart that God has great plans for her life and that she will be a teacher one day. I know this because she confesses it to me several times a year for the past couple of years. Her parents are very poor and it is unrealistic that they make enough money to pay for her to go to college. Their average monthly income is $30. Francisca wants to go to a college in Somotillo which is local to her. She has been awarded a full scholarship to attend but will need money for transportation, materials and food during the day. She will leave her home very early in the morning and return very late at night. I am looking for a sponsor or sponsors who would be committed to blessing her with $30 a month to make this happen. It can be one person or 3 people paying $10 each or even 6 people paying $5 a month. This money will pay for her to get back and forth to school, supplies she will need each month, food during the school day and maybe from time to time access to the internet for school projects. If you don't feel led to help her financially you can pray for her as she takes a new journey in her life, you can also bless her with things like a backpack, school supplies, school clothes, shoes or anything else God may lay on your heart. What a great testimony of God's love to be able to bless this young lady and give her the desires of her heart. She is walking by faith and believing God has work out a way for her. I am standing with her and believing that someone reading this God has already prepared your heart to bless her. I currently have 4 students attending college from this community and 1 more will be added this coming year not including Francisca. This is a huge accomplishment for these kids. It's a huge sacrifice for them as well. The odds of these students every being able to attend college without help is slim to none. I am so honored that God has put them in my life so I can share their hearts desires with others so together we can help change the outcome of their future. If you feel led to help send her to college (Yes I'm talking $360 a year to go to college) please let me know as soon as possible and I will give you more details. You do not have to commit for a the whole 4 years of college she will attend. I know that if God can bless her this year he will take care of her next year. I will need to know if you are interested by the end of this month. First payment will be due in March. If you would like to help with the other school items let me know also as soon as possible. I would need them also by the end of the month. Thanks in advance for allowing God to use you to be a blessing to Francisca.